Abby's Blog: Home at Last! Great interview. When we buy your book would you sign it for mom? I heard that your publicist rocks, big time. Hope you had fun at prom, kid. But Abby, guess what I got in the mail the other day! My US Sailing Basic Keelboat Certification! And gosh, I totally understand why sailing is so awesome now! There was one weekend where I had the luck to be caught out in winds that were blowing twenty to thirty knots, and it was the most fun I've had in a long time! Scared the heck out of me too, but it was so amazing. How do you handle it out there when the winds are blowing at seventy knots??? I actually learned enough to be able to understand most of the sailing language you used in your book, and it made reading about your adventure so much more enthralling. I ended up reading your book and your old blog archives side by side, and it was amazing seeing what you published while you were still out at sea and compare it to what you think of everything today! Who knows, you might have a 17 year head start on me, but perhaps eventually I can do something cool and amazing too like you did. :D You give the phrase "Carpe Diem" a whole new meaning. Make sure to have fun at your prom; seeing how fast you are growing, you probably won't have many more chances to live a teenage life! Smooth winds and keep on sailing forward, Abby! Abby, I purchased your book and am enjoying it very much. Enjoy the prom. Some time in the distant future, one of Abby's descendants will set out from Earth to become the youngest astronaut to circumnavigate the observable universe. Because faster-than-light travel is trivial by this point, it will actually be accomplishable in a reasonable amount of time without a significant resource burden or redefinition of the laws of physics, at least on a universal scale. Maybe locally. But this isn't to say it isn't dangerous, of course. Her vessel, while designed for solo deep-space high speed cruising and robust enough to weather most solar winds, will be disabled by a sudden ion surge in a distant corner of the universe by the J2329-0301 galaxy. Humans having mastered instantaneous quantum subspace communication millennia ago, sending a distress call is a viable option. Three races of spacefaring beings receive the call and coordinate a response (being that practically all intelligent life has been discovered and joined Facebook by this point, the news spreads quickly). Humans briefly become the focus of intergalactic criticism for letting her attempt such a dangerous feat for seemingly no reason. Luckily, a human space-fishing vessel (since we discovered that there are indeed edible lifeforms in space and they are, incidentally, delicious and plentiful. As well as nutritious.) is within two Earth-days of warp travel. Sadly enough, the vessel does not have the cargo capacity in its hold to transport the stricken astronaut's ship back to Earth, so it is left behind in the deepest of space. She's deeply saddened by the loss of her beloved ship, but everyone is ultimately grateful that she did not, too, perish in the raging ion storm. After a few weeks of camping on a variety of starfreighters, she is returned to Earth to great fanfare. Despite not finishing her journey, she showed a nickel-titanium resolve the likes of which few Earthlings can fathom. Some day, she vows to sail the vacuum of space again, maybe with some stronger ion shield generators. In the mean time, however she settles back down at home and decides to take on some other hobbies, such as riding space dragons. At least I think that's how it goes. abby, do you go to a public high school now or are you still homeschooled? great interviews! Sorry Abby...could you repeat all that... slowly? You went somewhere?...lol. Your "new friend" looks SHOCKED at what he just read. 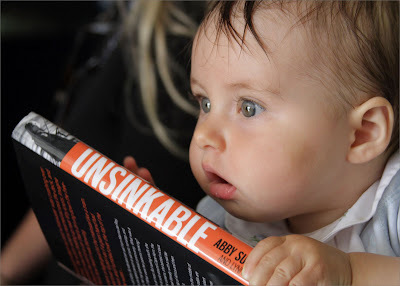 I had better get a copy of UNSINKABLE to find out why! I am sure your nice compliments for the folks helping you and watching for your best interests were appreciated. Experienced people like Lisa, Jason, and Bill really are important to have at your side when you put yourself out in often unfamiliar territory. And you handle yourself so well too. Have fun...and of course we will need a full report with photos...lol. Enjoy. Enjoy being a teenage girl at your prom! You're growing up so fast! Savor your youth! looking forward to see those prom photos! great book. really inspiring. cried at parts which is saying a lot because I hardly cry when I read books! amazing story. I've realized that when I said that you were a great inspiration for us I was right. You have finished your travel for almost a year, and are still able to surprise me with your travels, book,...and whatever you do! I haven't read your book yet, but I'll read it as soon as possible. HAVE FUN AT PROM!!! Who will have the honour to dance with you?? Congratulations for everything, especially for your blog. You always make me dream! It was wonderful to meet you in Houston at the Boat Show, Abby. I have learned to sail late in life and have been inspired by your courage. I will think of you next time I am heeling over and will try not to be so afraid! I was born in VA Beach, my mom used to work for the 700 Club, and I grew up on the TX coast. Ha. Just thought that was interesting. If you're ever in the Austin area, hit me up and we can hang out for sure. life gets a bit crazy at times... but that's part of it... just have fun and enjoy being young abby!!! Abby don't forget to send some prom pics. When you talked about your kitties and how you didn't want to get up so that they wouldn't wake up,it stirred up memories of my cats when I was your age. You would be surprised to know that I did the same as you when they were on my lap. One of my cats even slept in my arms while I watched t.v. and you could here her kind of snoring a bit. Just have to say... @ ChArLeSq- best comment post ever to one of Abby's blog entries. LOVED it! @ John GlobeMasterOne, my friend ;0)... yes, I think she went somewhere, but my eyes were crossing like yours when I read all that. @ Abby- I read your book in 2 days and although the whole thing was enthralling, I can't believe you were plastered against the main, with the deck vertical, clipped in and your feet dragging in the water. I'm going out sailing to Anacapa tomorrow and I'll think of you while we're out. (Wanna come?) I'm sure Anacapa's got to be the most boring thought to you now after you've done all that good stuff! No kitties but Have a minature parrot name of PeeWee; favors naps inside my shirt, sometimes I must remain almost motionless for an hour and so he'll rest quietly. As for Unsinkable, I am rationing the reading maybe two pages at a session- so your saga will last me a while longer... thanks again Skipper. Well, you brave, incredible creature, I hope you never find the end of adventure, unless your eyes get a little puffy with dark circles. Then you need a break. But only a short one. I'm glad my mother did not spill her temper upon you beyond trashing your beloved Wild Eyes. I didn't get the last word on her. Was she found? Would you give it here, please? Thank you so much. By the way, Miss. Abby, as the story of your trip unfolded, I was terribly moved by the loss of your vessel and wrote a poem for her on your Facebook. But some very rude dude got up in my face and it just felt bad, and he made it worse with each comment so I apologize for that. I left Facebook and it looks like my post left with me. But I kept the poem and offer it here because truly, it belongs to you. It's on my blog. She was faithful to her charge, and her spirit deserves a memory. Hmm... maybe I'd best just give it here. I honestly wish for you to know that we your fans truly shared the adventure and the loss with you. as thoughts recall your traipsing prow? Adrift beyond the Eastern Seas. a fiery soul no waters quench. warm comfort in the storm filled nights. beyond the moonlight's trailing beams. dreams held aloft on rushing spar. in peaceful calms of quiet haze. while words of disenchantment mocks. and sacred, held her precious life. and her precious Wild Eyes. Just bought your book today! Though the on the spot blogs from the middle of the journey will be hard to beat, I certaintly am sure I will enjoy every word. Best wishes to you and the family. I just finished reading your book and it was great. Very well written and the three perspectives idea really worked well. I still have lots of admiration for you and respect for your wonderful parents. Well I finished the book in a day so clealry it was a great read! My 9 year old Daughter has started to read it now! I hope she gets some insperation reading about another independent young lady! Though if she talks of crossing the world solo, we might have to talk! LOL Thanks again for your journey. One question, I know there was hope of Wild Eyes making her way to shore one day. Has there been any sightings? On 700 Club you said that you probably wouldn't be here if it wereen't for worldwide prayers. How could that be? The rogue wave had already cracked your boat and bruised and bloodied you. Did Jesus walk to you across the sea as he did for the Apostles on the Sea of Galilee when they were storm-stricken and in danger of sinking? Are you saying prayer allayed any further storm from arising and swallowing you before rescue? Had Jesus arrived to stay invisibly with you till prayer started? That day I stopped at our church and looked upon a young Jesus with a dangling sandle from a broken strap. He was held up by His Mother so he would not dash his bare foot against a rock. Gratitude in his eyes show clearly. On 700 Club there was unmistakable gratitude and sincerity in your voice about being saved and something else. Along the way, you have given other clues about "this something else" that was major in making your journey. You had more to lose than to gain by this voyage, so it seems it wasn't fame and fortune as you have been accused. Nor your Dad and Mom and Zac leading you on. Rather you alone shepherded them along till they gave in to the spirit of innocence. That is the other something I hear in your voice.I don't mean childish, naive, or inexperienced innocence; but rather the spiritual depth of innocence that is forever. I mean the feelings and the places the goodness of innocence brings you to. Its brilliance. It is all written in Avril Lavigne's song INNOCENCE about what it means, how it makes her feel, the need for it, the happiness inside, how it makes life great, and not to let it pass you by. I guess it takes a female christian girl to describe what another Christian girl feels about seeking her own dreams by reaching for innocence in places she loves most. Avril schooled at a Canadian Christian Academy and Abby is Born Again of the Spirit. I challenge anyone to closely compare Avril's INNOCENCE lyrics to Abby's need to make her sea adventure with the light of good training and knowledgibility to reach her star. Avril has the Fine Art talents to prove the brilliance of innocence in so few words and voice. She says it makes you want to cry and she wouldn't change a thing about it. Faith is a mystery and so is innocence. It makes life great and powerful. Those surface comments of criticism that hurt Abby and her Family originated out of ignorance of the brilliance of innocence. So there it is. Had Abby appeared selfish in her goal, it may only have been in reaching for her own innocence. Good luck with your next trip around the world! Can't wait to see you accomplish your dream!